Museums not only connect us to our rich pasts, but ignite people’s passions and curiosity. When we can all share in that history it allows us to see how interconnected we are, and build a future that brings us together. Come and visit us at The Braintree Historical Society and at the Gilbert Bean Barn and Mary Bean Cunningham Resource Center ... and Have Fun! The early railways of New England were pioneers in the development of a vast network of railways which eventually extended throughout the entire country. One of the earliest and most important of these early railway systems was the Old Colony Railroad, which opened for business on November 10, 1845 and ran between Boston and Plymouth. This early Old Colony line would eventually become part of a vast railroad network which ran through South Eastern Massachusetts and into Rhode Island, and remained under the control of the Old Colony Railroad Company until it was absorbed by the New York, New Haven and Hartford Railway in 1893. The presence of the railway also allowed Braintree to develop from a small town into an active commuting suburb. The railway became a major means of transportation (then as now) for commuters and its presence allowed people from Braintree and other towns on the South Shore to travel further afield to jobs in Boston and the surrounding area. Many of Braintree’s residents were also directly employed by the railway and the South Braintree Square area was an important location of railway facilities and repair depots for many years. 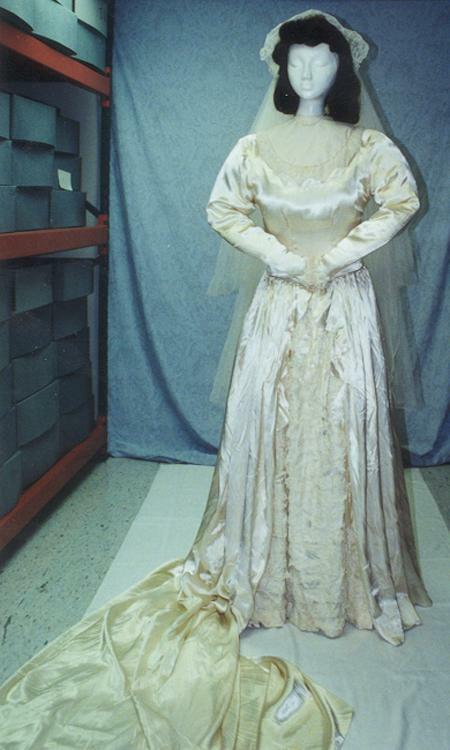 This lovely dress was designed by the donor and made at Rosina’s Bridal Shop on Salem Street, Boston. Nancy Guiliano wore this gown for her wedding on October 12, 1946 when she married Carmelo James Nicosia at St. Francis of Assisi Church in South Braintree. The gown stayed in the family and was worn by Nancy’s sister, Mary Rose, on the occasion of her wedding to Alfred Sorrentino on October 12, 1949. The gown is of white satin, trimmed in lace rusching with a five foot train. 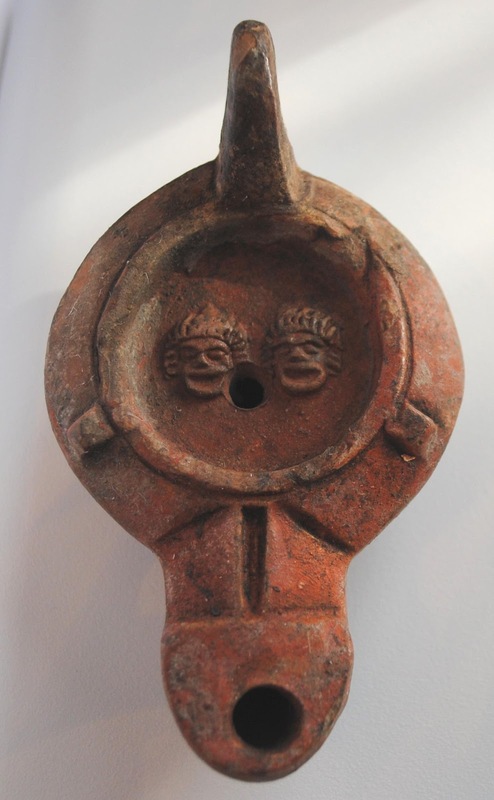 This Roman era oil lamp is made of terra cotta, with two comic theatre masks, a type called a “factory lamp”. Such lamps were produced in Italy and imitated in the western, Latin-speaking provinces. This lamp is well-made and dates to 70-100 A.D. 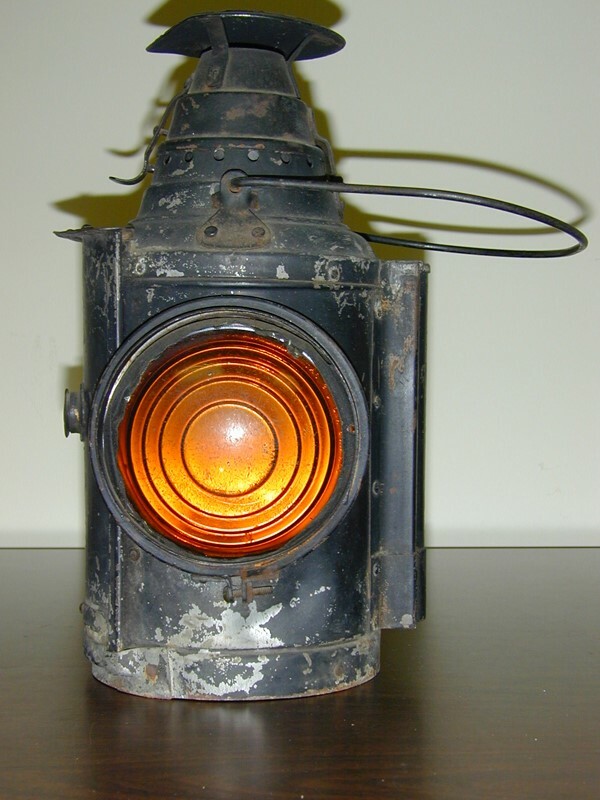 This lamp is now on exhibit in conjunction with the October 18th talk by Ron on the Re-dedication of the Mary Bean Cunningham Historical Resource Center. 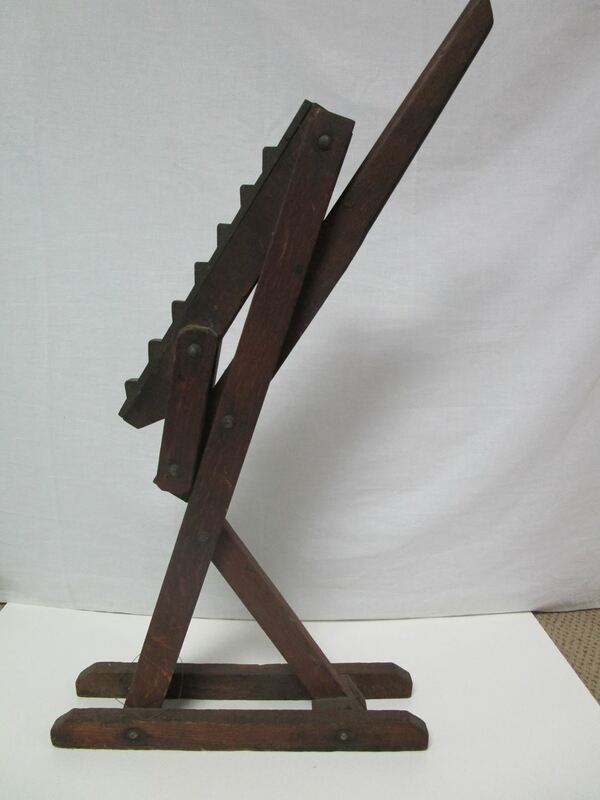 The wood fame jack with iron serrated edge was used to lift your wagon, carriage or cart when the wheel broke or fell off or the axle was damaged. They were in extensive use throughout the world until the beginning of the 20th century. From 1874, the Underwood family made typewriter ribbon and carbon paper, and were among a number of firms who produced these goods for Remington. When Remington decided to start producing ribbons themselves, the Underwoods opted to manufacture typewriters. The original Underwood typewriter was invented by German-American Franz Xaver Wagner, who showed it to entrepreneur John Thomas Underwood. Underwood supported Wagner and bought the company, recognizing the importance of the machine. 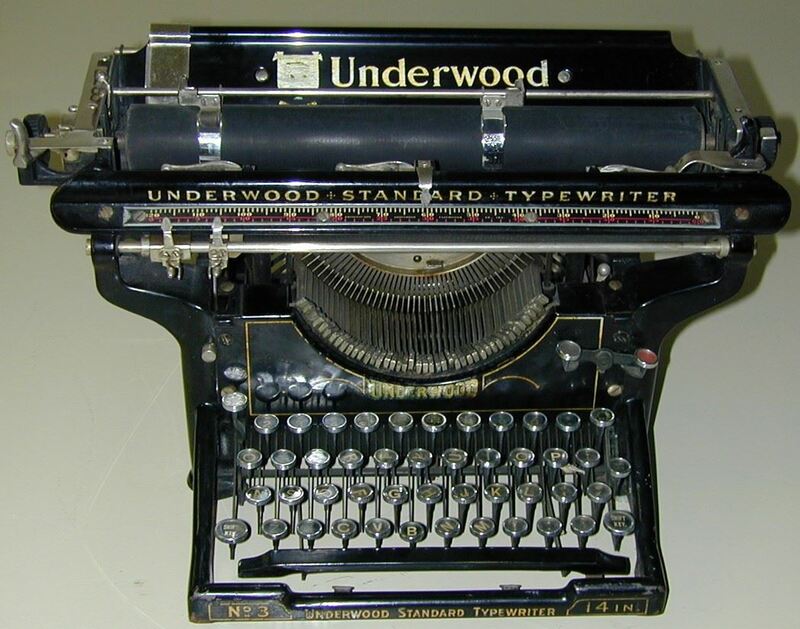 The Underwood No. 5 launched in 1900 has been described as "the first truly modern typewriter". Two million had been sold by the early 1920s, and its sales “were equal in quantity to all of the other firms in the typewriter industry combined”. When the company was in its heyday as the world's largest typewriter manufacturer, its factory at Hartford, Connecticut was turning out typewriters at the rate of one each minute. This clock was bequeathed to Braintree Historical Society for the Sylvanus Thayer Birthplace by Mrs. Howland of Braintree in 1978. The clock bears the name of the maker, Nathaniel Mulliken of Lexington, MA. The Mulliken's, five of them in three generations, were among the most prominent of early American clockmakers. Nathaniel I (1722-1767) manufactured clocks in Lexington from about 1750 until his death in 1767. His son, Nathaniel II (1752-1777), also work in Lexington. His shop was burned by the British during their retreat from Lexington on April 19, 1775. The finial brasses on the clock show the likeness of the British statesman, Charles James Fox (1749-1806) who, beginning in 1774, championed the American cause in Parliament in opposition to the policies of Lord North. The donor said the clock came from the home of her husband’s uncle, William Reed (1832-1902) of 333 Pond Street here in Braintree. He was the third William Reed to live in the house, his grandfather having purchased it from his father-in-law, Stephen Penniman, in 1809. How many generations of Reeds owned the clock has not been determined. It is of interest to note that the inventory of the estate of the first William Reed to live in the house contains a 8-day clock valued at $12.00. This three piece silk Walking Dress was worn by Isabelle Coggill Nash, the donor’s grandmother. Isabelle was born August 17, 1849 in Leeds, England. She married Stephen Edward Nash in New York City October 27, 1875. The donor thinks the gown came from the prestigious Worth Boutique in Paris because Worth made Miss Coggill’s wedding gown. This lovely blue silk is of the same time period. Although walking was a practical way to get around, it posed a number of problems for the fashion-conscious lady. For 19th century women, image was everything and they were expected to appear dignified and fashionably dressed at all times, especially when walking on the street in public. 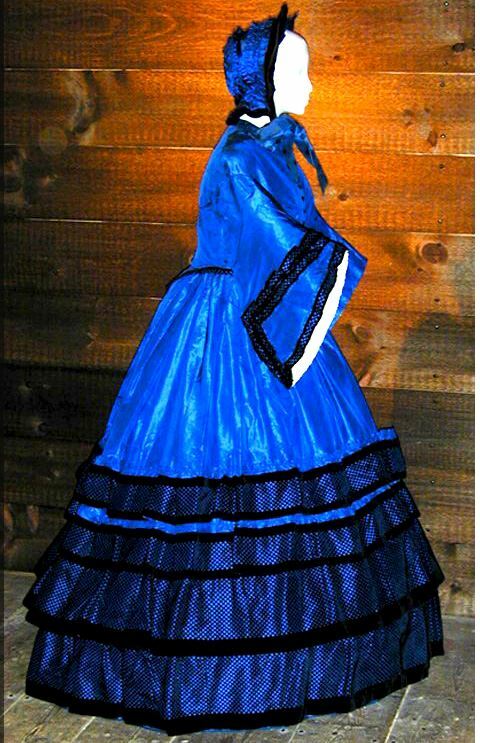 Long, full skirts, often worn with a bustle and ending in a small train, were the order of the day in the 1870s and although they were considered the height of femininity, they were easily soiled by walking in dirty streets, and the indignity of having to lift one’s skirt above the ankle proved as much of a problem for many women as the dirt. One of the ways of solving both of these problems was to wear one of the shorter trainless “walking” outfits, which were introduced in 1867. The skirts of these “walking” outfits were a uniform length all the way around with the hem raised slightly above the ground in order to avoid dragging in the dirt. – In 1870 the first all metal two wheeler appeared. Previous to this metallurgy was not advanced enough to provide metal which had the strength to make small, light parts. The pedals are attached directly to the front wheel. Solid rubber tires and the long spokes of the front wheel provide a much smoother ride than its predecessor. The front wheels became larger and larger as makers realized that the larger the wheel, the farther you could travel with one rotation of the pedals. You purchased a wheel as large as your leg length would allow. 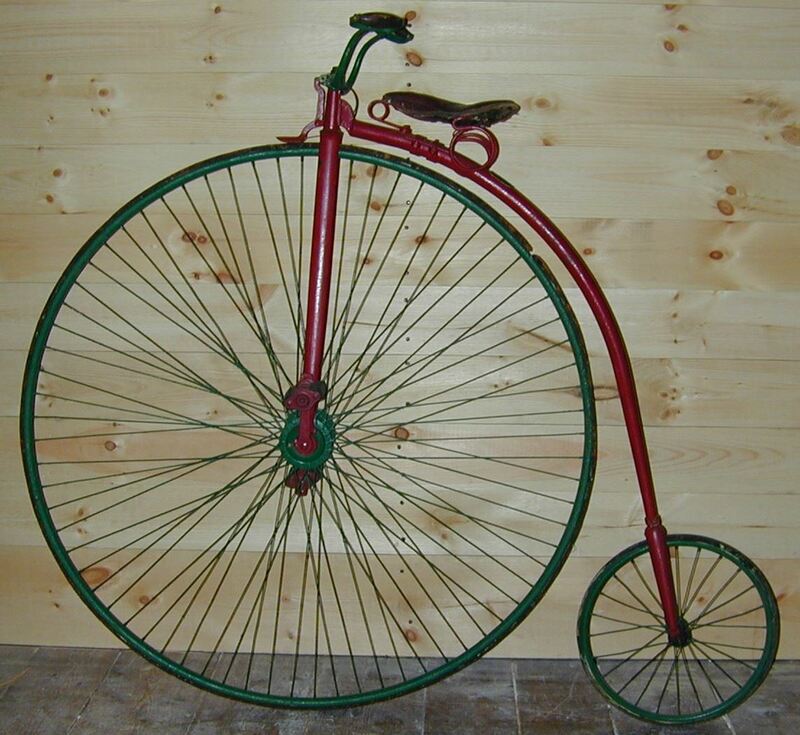 This machine was the first to be called a bicycle (“two wheel”). Because the rider sat so high above the center of gravity, if the front wheel was stopped by a stone or a rut in the road, the entire apparatus rotated forward on its front axle and the rider, with his legs trapped under the handlebars, was dropped unceremoniously on his head. Thus the term “taking a header” came into being. 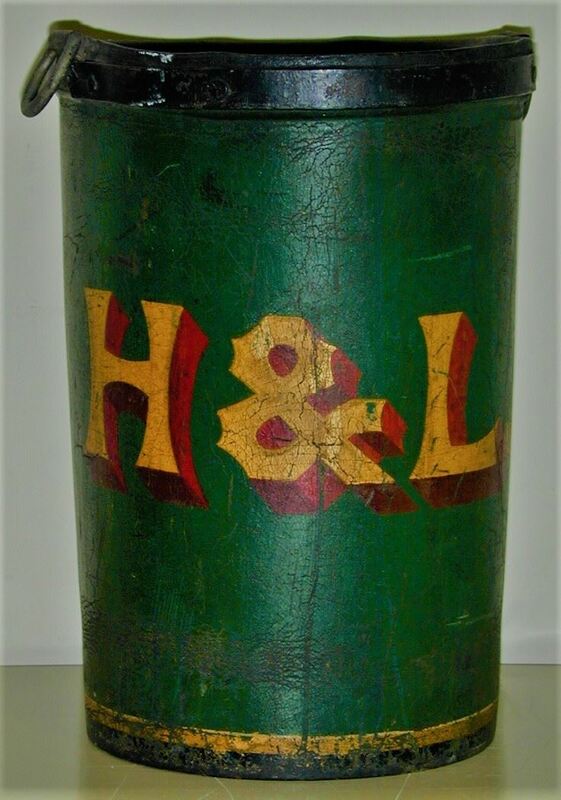 -This painted leather fire bucket was used in Braintree from the Hollis Avenue Fire Station which was constructed in 1875. This fire station was home to Hook and Ladder Company No.1. Every building had at least one bucket near an entrance. When the Fire Warden called, citizens were obliged to join the “bucket brigade” to staunch the fire. A “Bucket Brigade” consisted of two lines of people who positioned themselves between the water source and the fire, One line of people passed the full buckets along the line to the fire while the other line passed the emptied buckets back to the well or pond or brook. -Most early dolls were made in England of wood with painted features. The next oldest are “papier mache” dolls, as the one shown. These were made from the beginning of the 19th century through the early 20th century. These dolls were mass-produced in Germany, France and the United States. The first well-known American doll maker, Ludwig Greiner of Philadelphia, made “papier mache” dolls from 1840 to 1874, and then his sons ran the business until 1883. Most “papier mache” dolls have molded hair painted black, wooden limbs with a kid body, and painted eyes. A common household item in the 16th through 19 centuries. This Y-shaped bone instrument was probably made by sailors from whale bone. It was used to stretch gloves after they had been washed. While the wool, leather or kid gloves were still damp, the pincer-like shaft would be inserted into the fingers and then gentle pressure on the two handles would separate the two halves of the shaft, thus stretching the glove finger back to its original size and smoothness.